Earlier this month, I saw a film put on by the Unearthed Project at the Potteries Museum. The project aims to improve awareness of the Lidice massacre and the tremendous generosity of Stoke on Trent’s miners in helping to rebuild the village of Lidice. As part of the project, I promised to tell the story to at least two people. 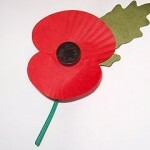 This blog post is part of my fulfilment of that promise. On the 27th of May 1942, SS-Obergruppenführer Reinhard Heydrich was being driven to his office at Prague Castle. In Prague, his car was attacked by two men. Both men fired on the car, and when it stopped, one of them threw a modified anti-tank grenade into the car, which wounded both Heydrich and Kubiš, the thrower. Both Czechs managed to get away, leaving Heydrich and his driver, SS-Oberscharführer Klein, wounded. A state of emergency was declared in Prague and a massive search was undertaken for Heydrich’s attackers. Eight days later on the 4th of June, Heydrich died of septicaemia. By the time of Heydrich’s funeral on the 9th of June, Heydrich’s killers had still not been found, but the village of Lidice was suspected of helping Czech resistance members. Hitler had decreed that the village should be literally wiped from the face of the Earth. Members of the Ordnungspolizei and SD (Sicherheitsdienst) surrounded the village and took the men out of the village to a local farm, where they were shot. A few of the children were chosen for “Germanisation”, and adopted by SS families, to be brought up as Germans. The others were initially sent to Łódź, then later to an extermination camp. The women were taken to concentration camps, where they were forced to work. The village was burned down, then the remains of the buildings were blown up and bulldozed. The remains in the town cemetery were dug up and destroyed. The village was completely razed, and the rubble cleared away, leaving nothing to indicate that Lidice had existed. The destruction was filmed, and the events were announced to the rest of the world. Towns in various countries were named after Lidice to commemorate it, and to ensure the name lived on, in defiance of Hitler’s intention to remove all memory of Lidice. 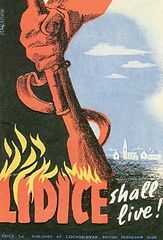 In the UK, Dr Barnett Stross, the MP for Stoke on Trent, and Arthur Baddely, President of the North Staffs Miners union, founded the “Lidice Shall Live” campaign. This campaign aimed to raise funds to pay for Lidice to be rebuilt, and was launched in September 1942. The miners of Stoke on Trent pledged to give a day’s pay every week, and by the end of 1945, they had raised over £32,000 (the equivalent of £1,000,000 in 2013). The rebuilding of Lidice started in 1947. As a mark of gratitude to the people of Stoke on Trent, a road in the new village was named after Dr Barnett Stross. The story of Lidice and the miners’ fund raising seems to be largely forgotten, and so the Unearthed project aims to improve awareness of the story and the link between Stoke on Trent and Lidice. A memorial sculpture is to be included in the new bus station currently being constructed at Hanley, in Stoke on Trent. This sculpture will have miner’s tags, each one stamped with a code that identifies a member of the public that has promised to share the story with at least two other people. If you’re willing to share this story with two other people, please make your promise at the project’s website and claim your tag.